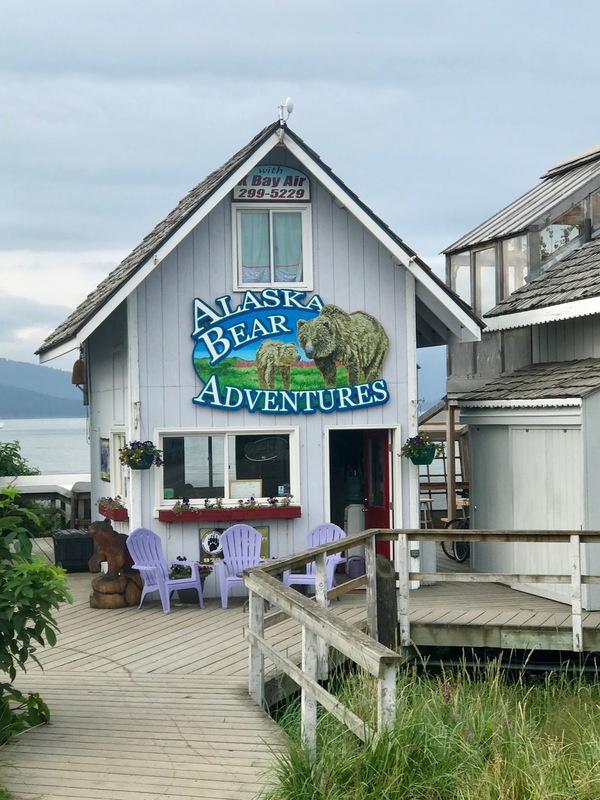 The perfect July day in 2017 - blue skies, no bugs, lots of bears, and a great guide pilot! George's brother Steve and his wife Lois suggested this adventure. 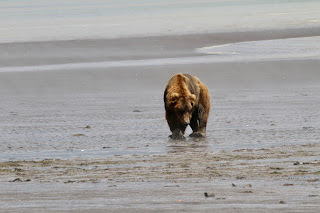 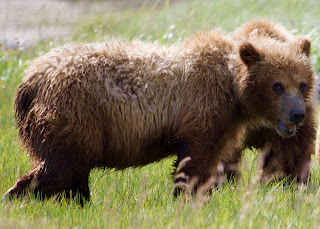 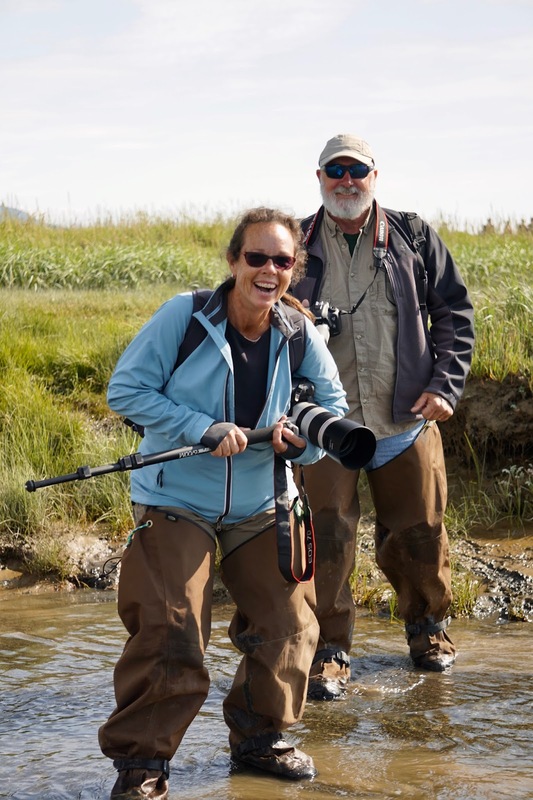 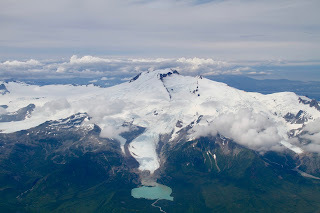 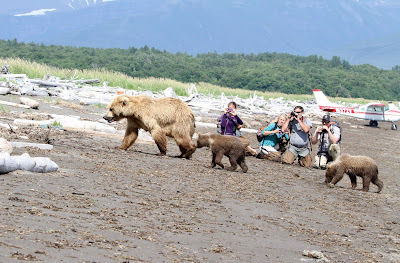 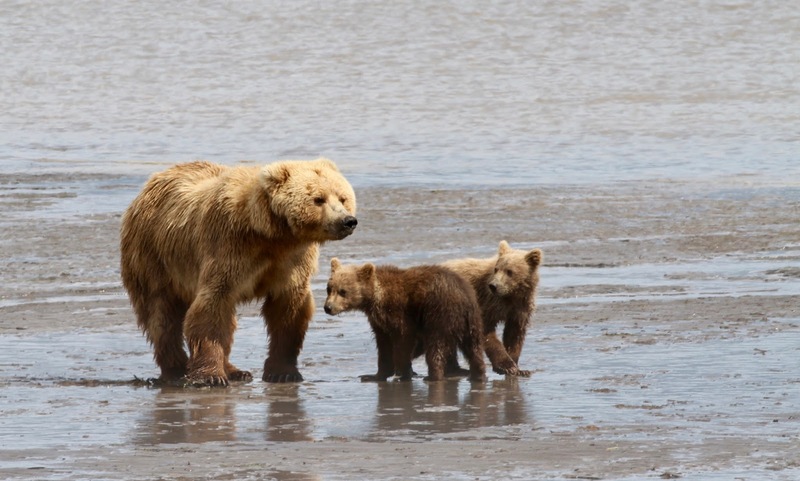 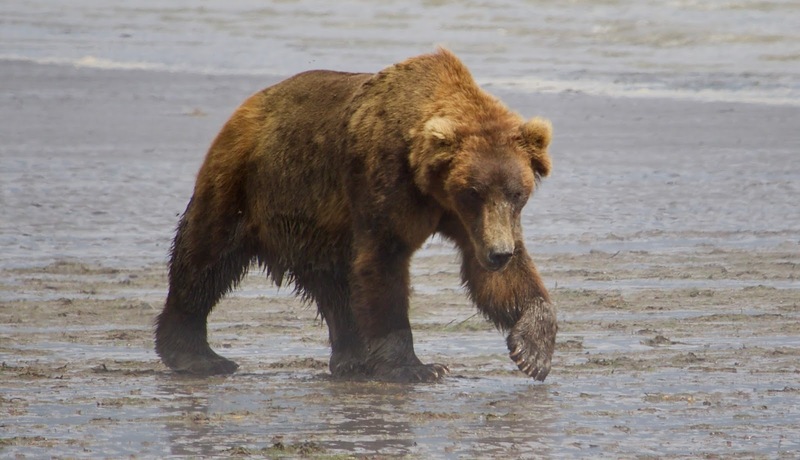 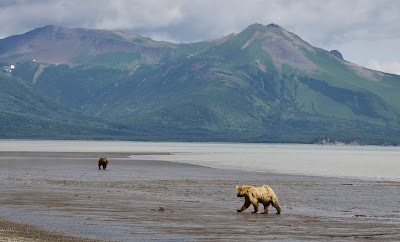 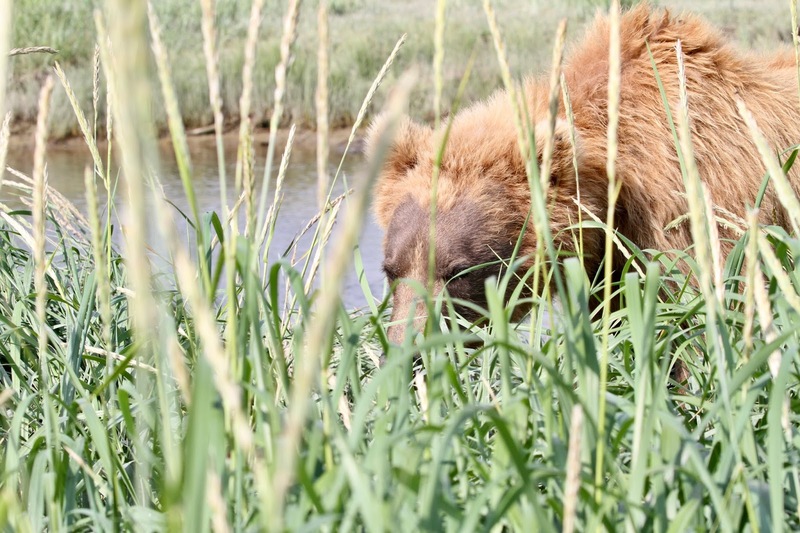 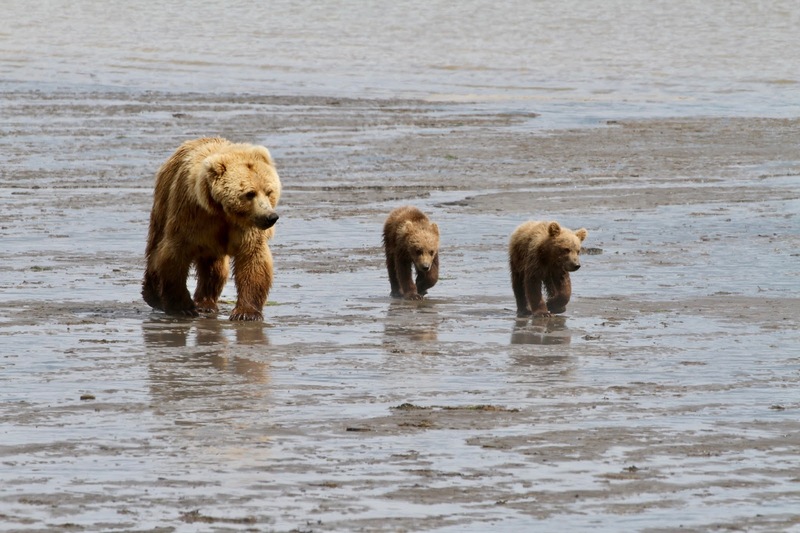 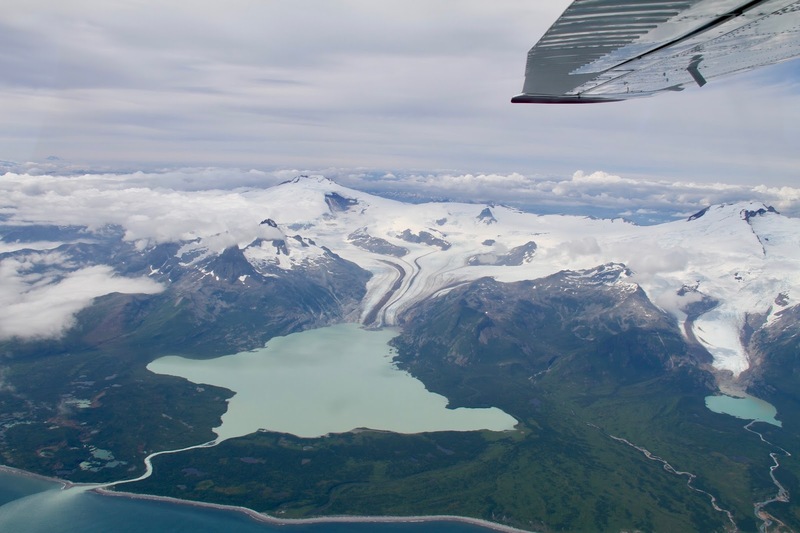 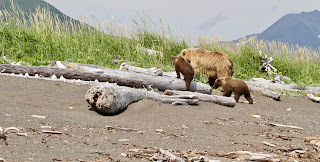 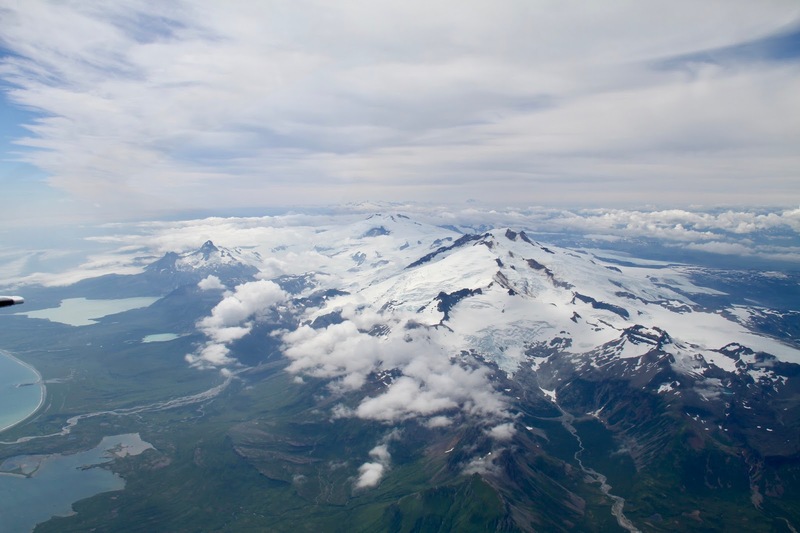 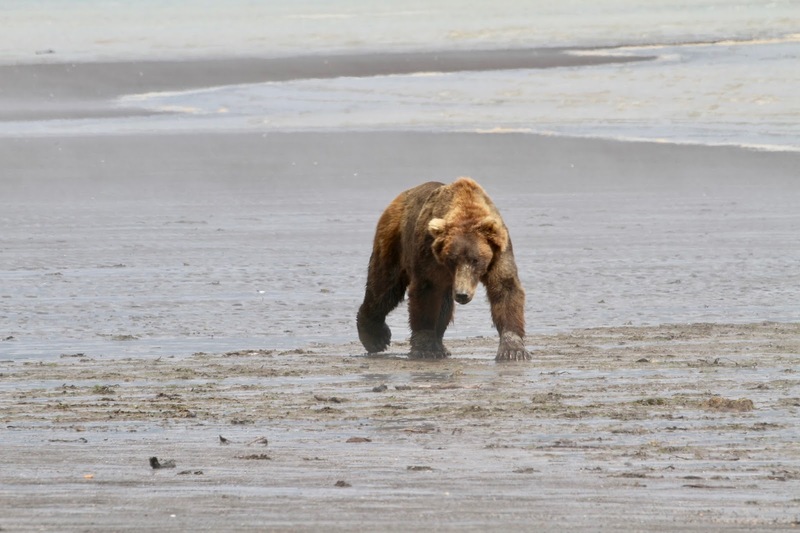 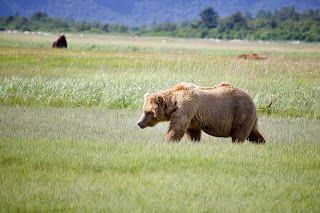 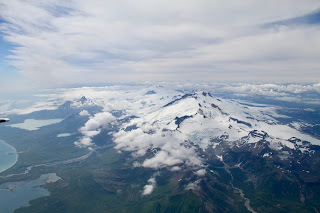 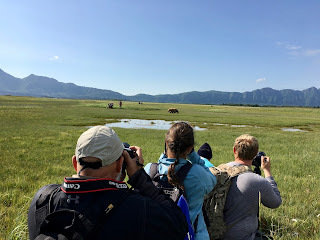 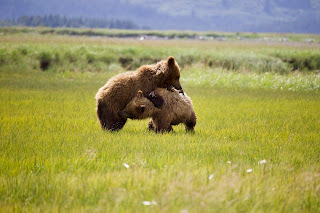 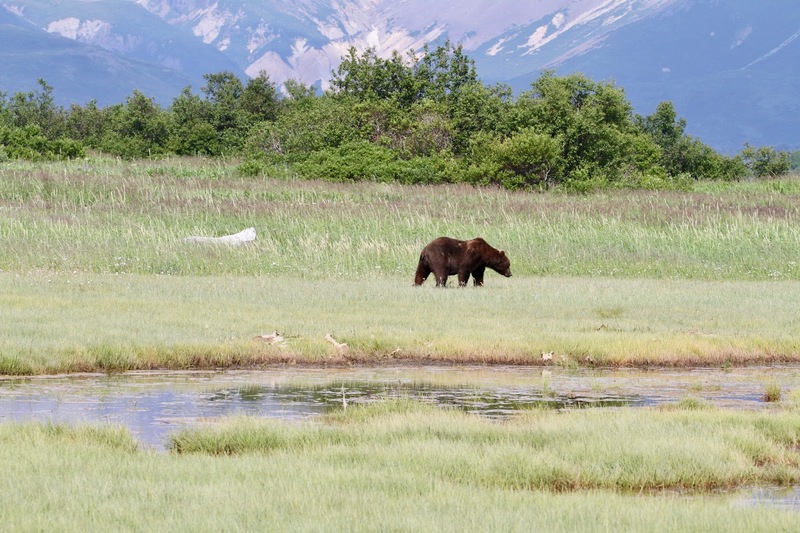 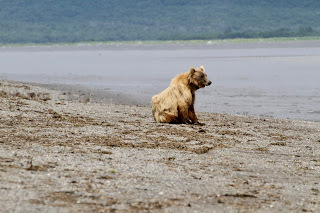 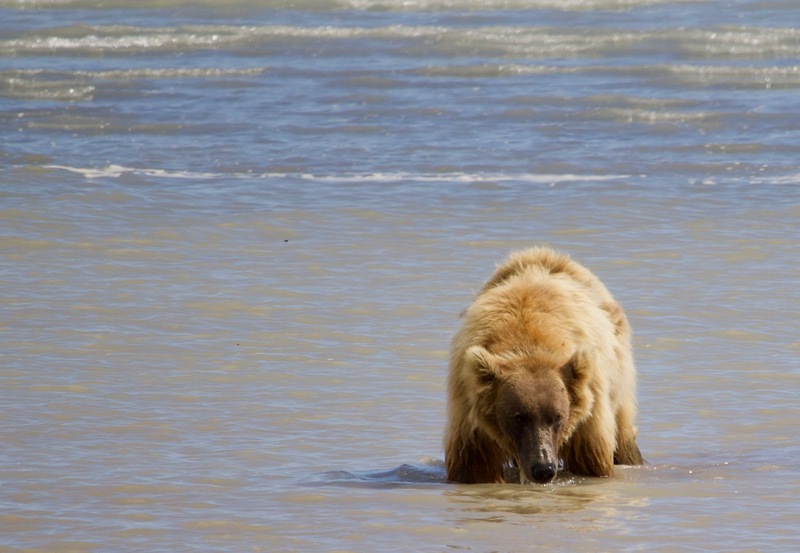 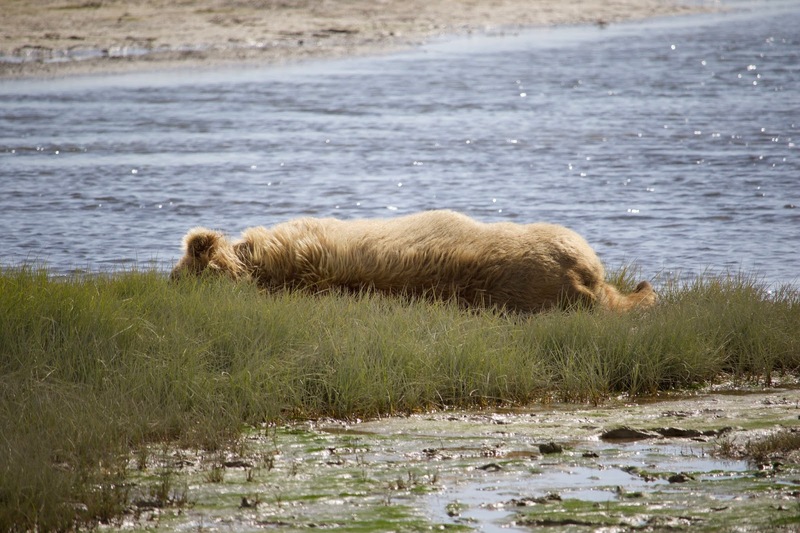 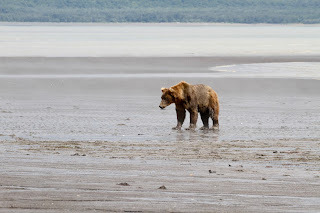 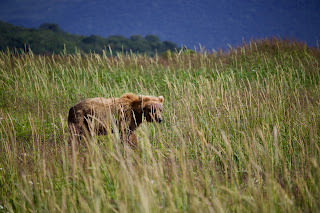 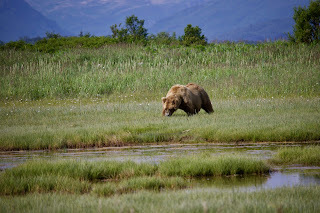 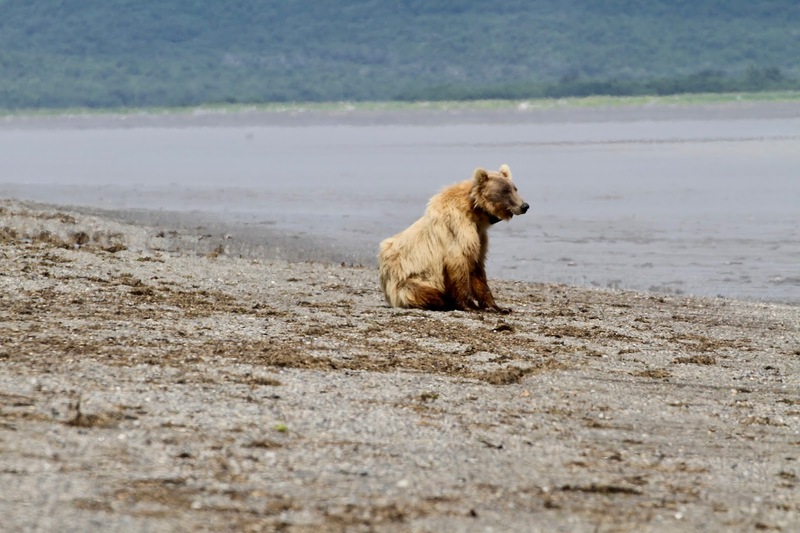 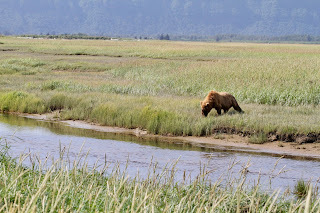 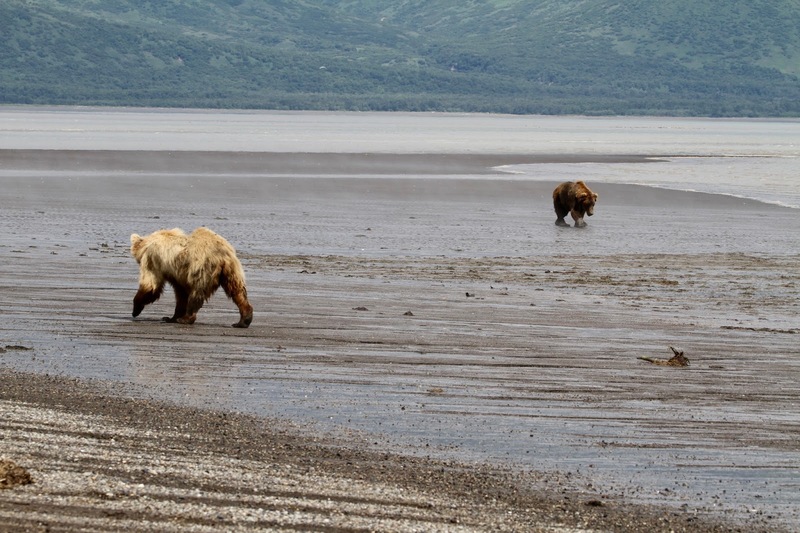 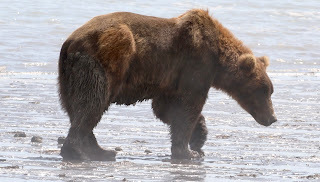 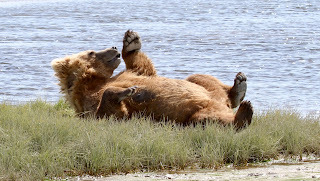 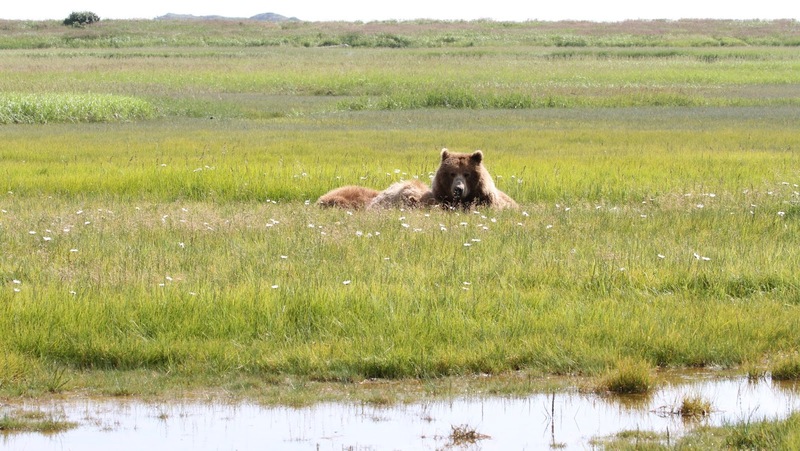 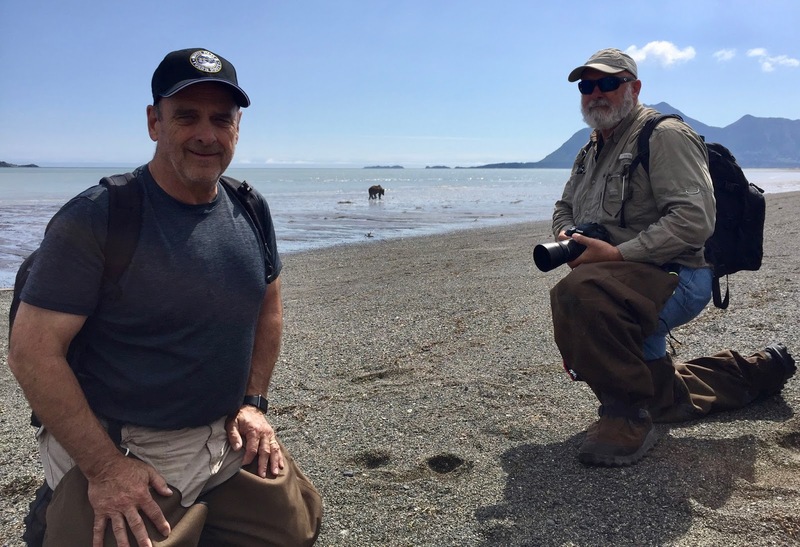 I wasn't sure about getting on a tiny plane, flying to Katmai National Park, landing on a beach and walking the island with Grizzly Brown bears, but WOW is the only word we have now - it was truly an AMAZING experience!!!!! We took thousands of pictures that day, but have picked out the best ones that will tell our story - we hope you you enjoy and appreciate you taking the time to come along! 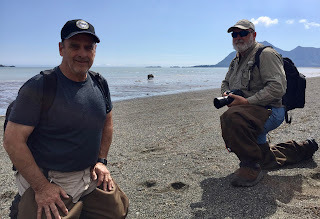 Their little office on the Homer Spit - this is where we had to weigh in for our adventure the next morning. 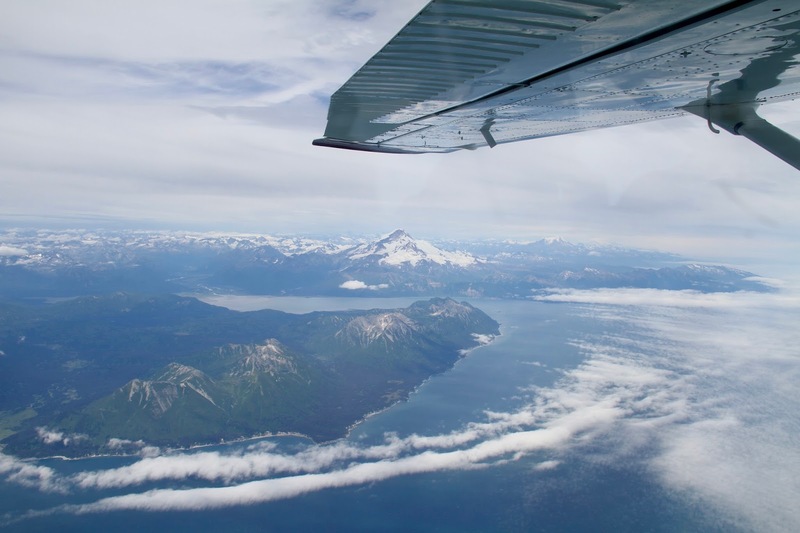 On such a small plane, it's important to follow weight restrictions. 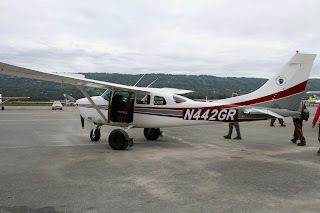 Early morning departure, we've had our briefing, put on our wading pants and are walking out to board this tiny plane! 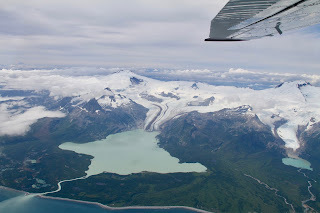 Shortly after take off, the sun had just risen, it was shining through the clouds creating diamonds on the water below! 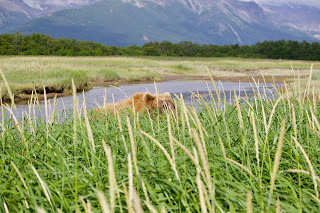 Here's our first bear sighting! 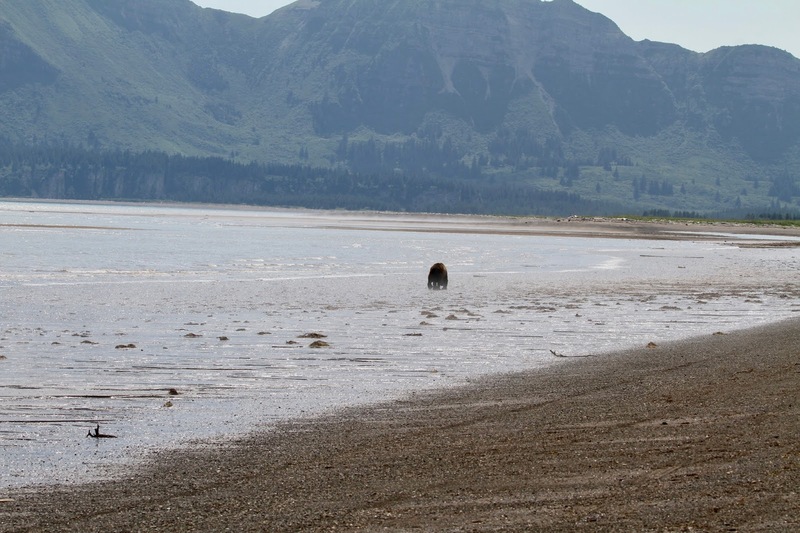 We also saw a wolf running down the beach before we landed. 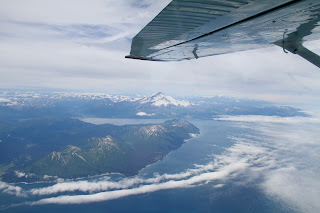 There were five planes in our group, each plane carried six people including the pilot. 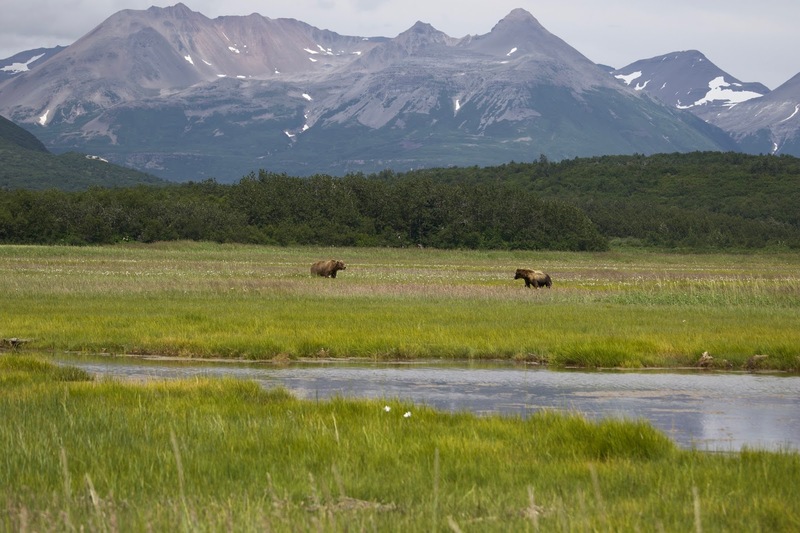 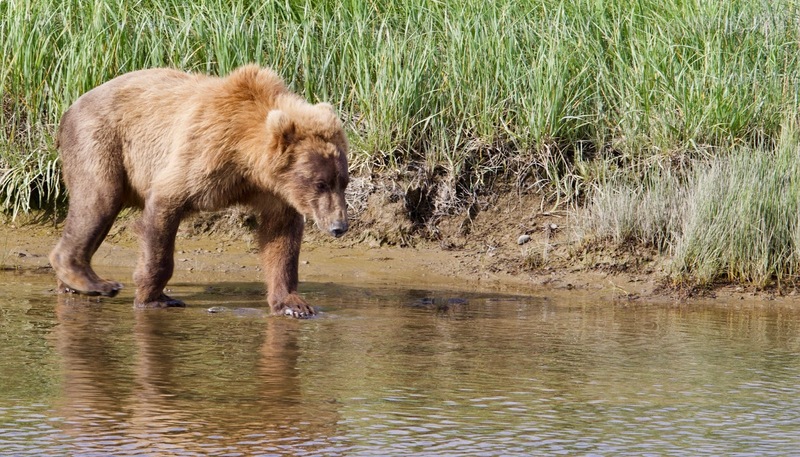 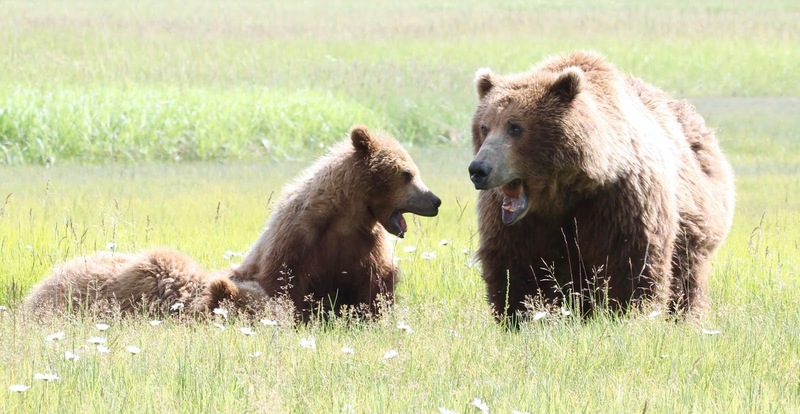 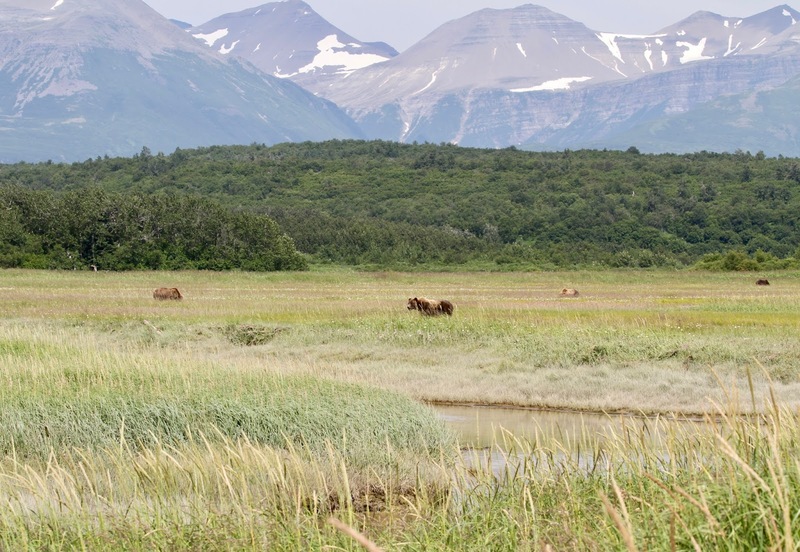 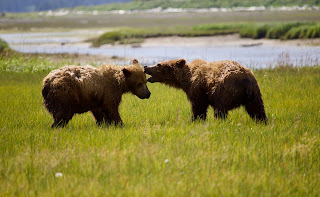 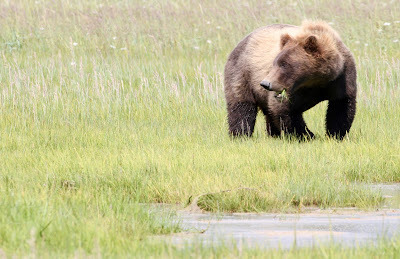 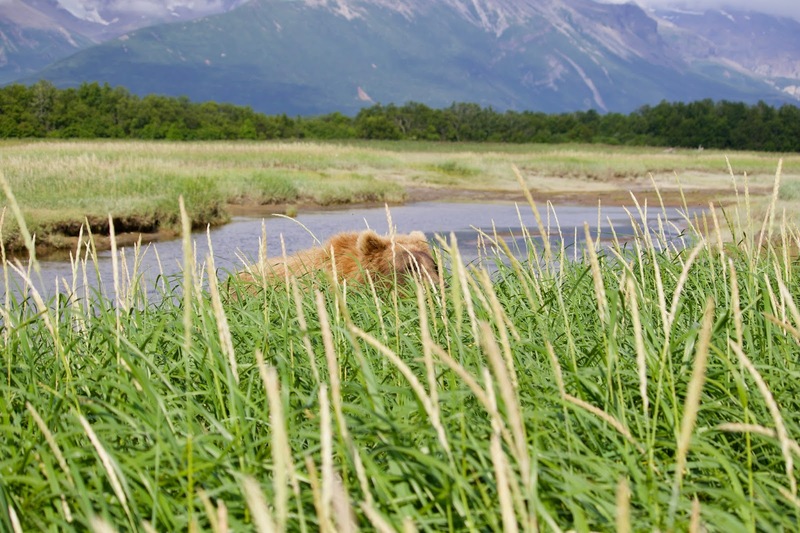 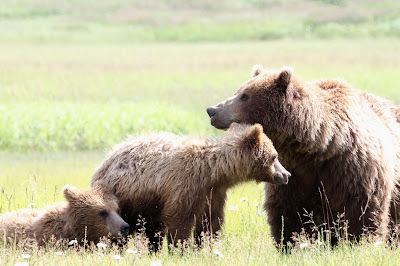 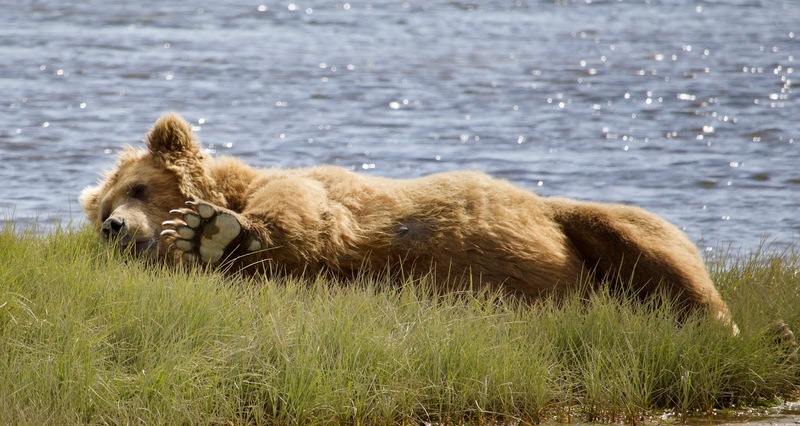 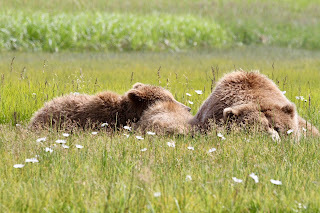 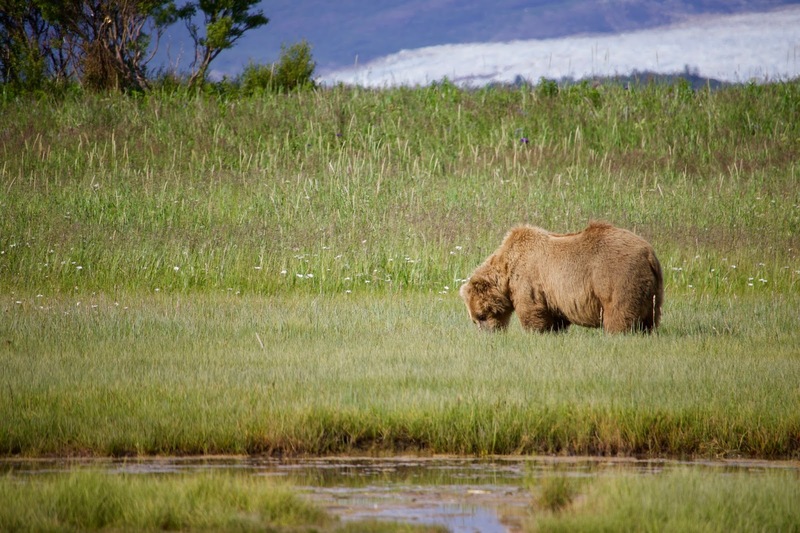 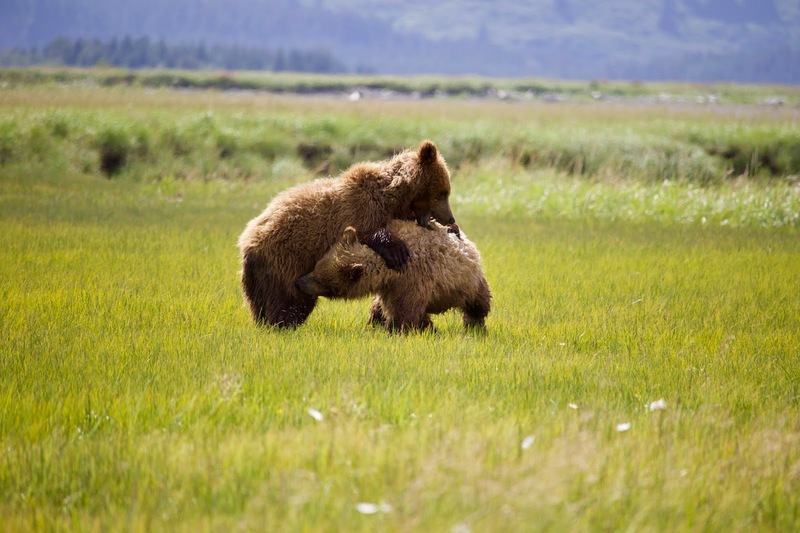 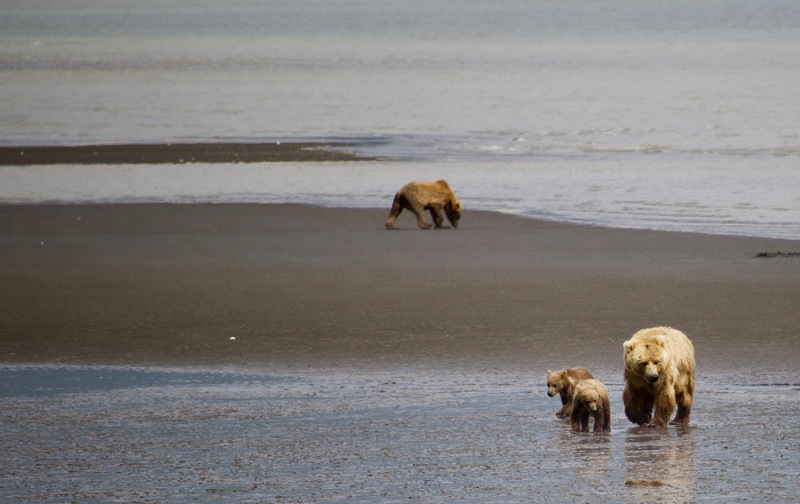 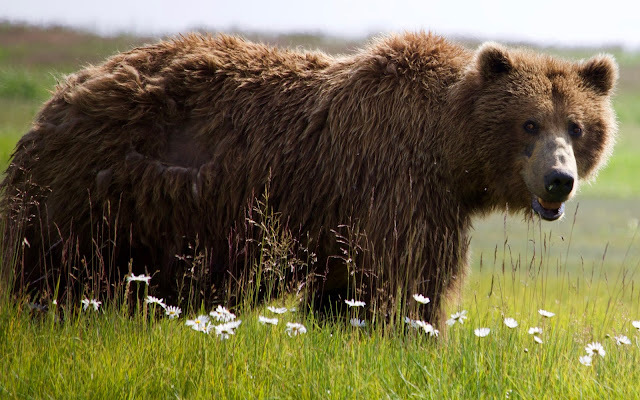 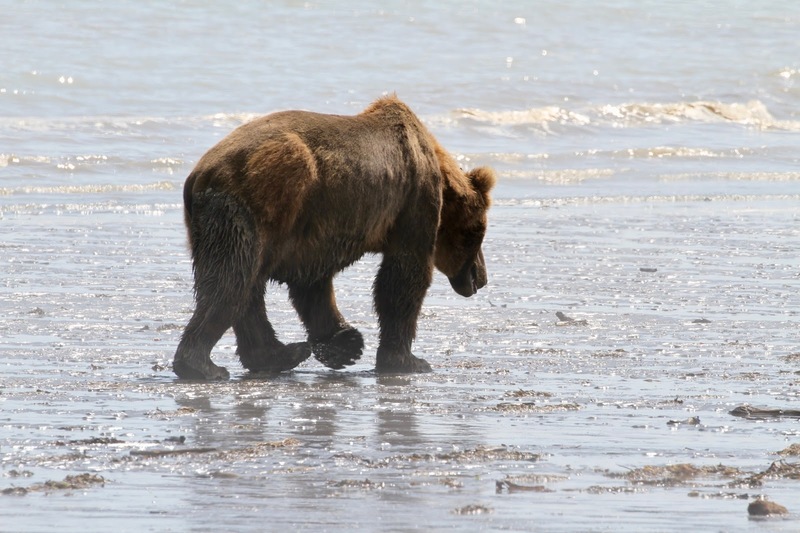 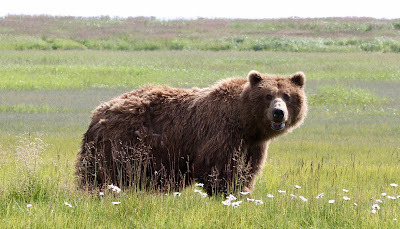 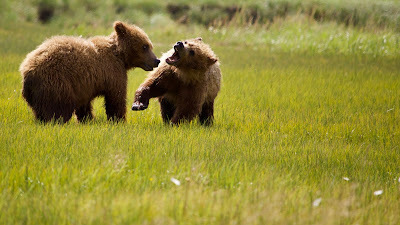 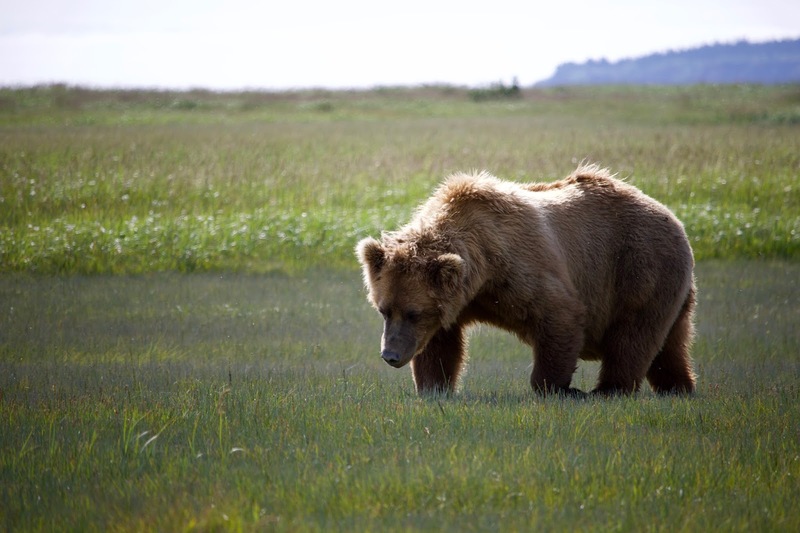 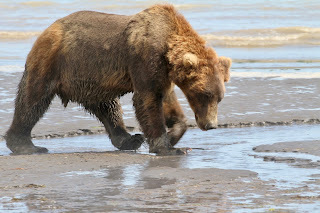 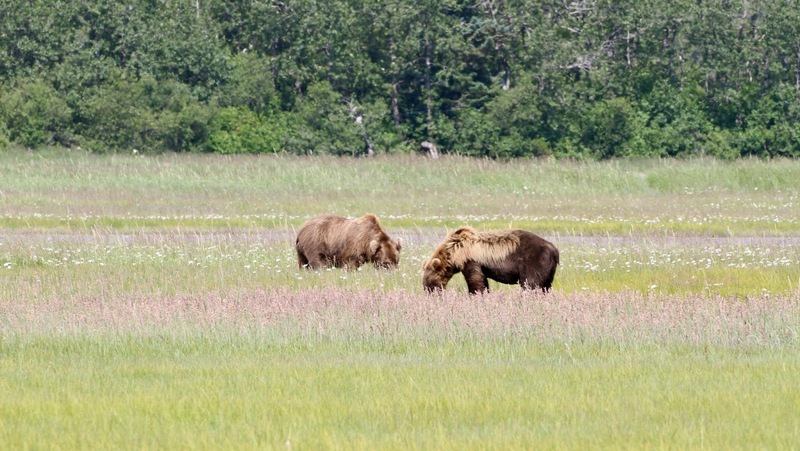 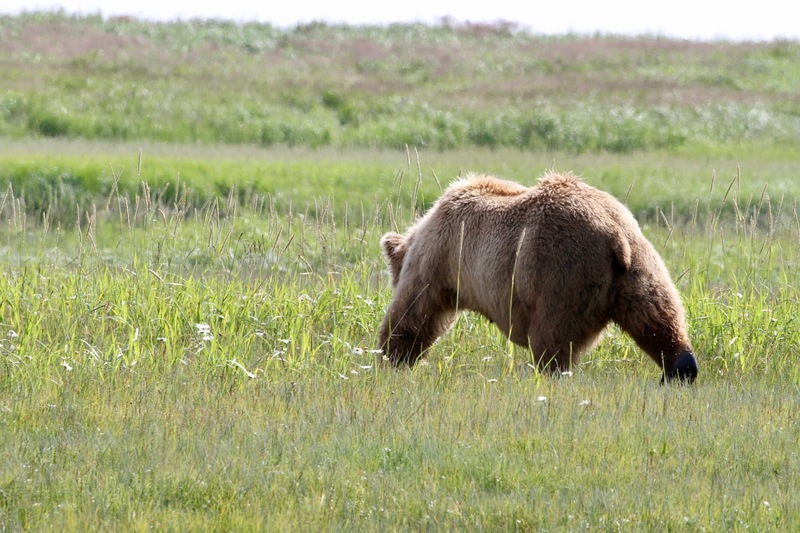 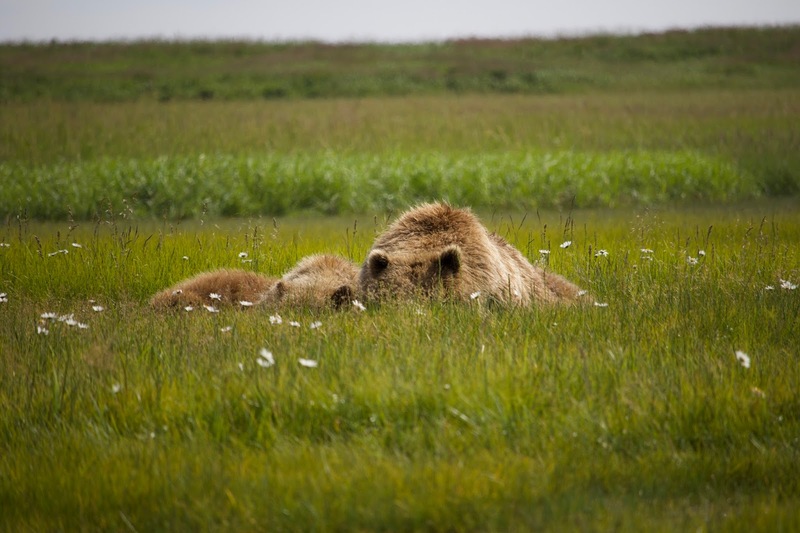 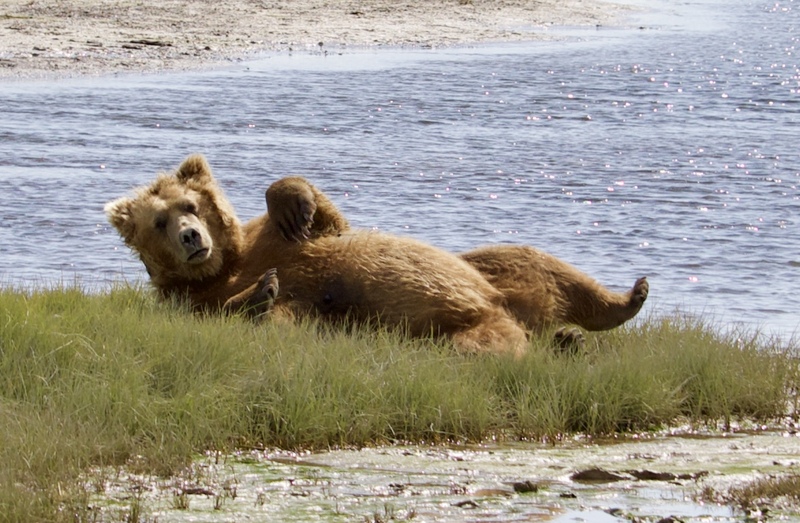 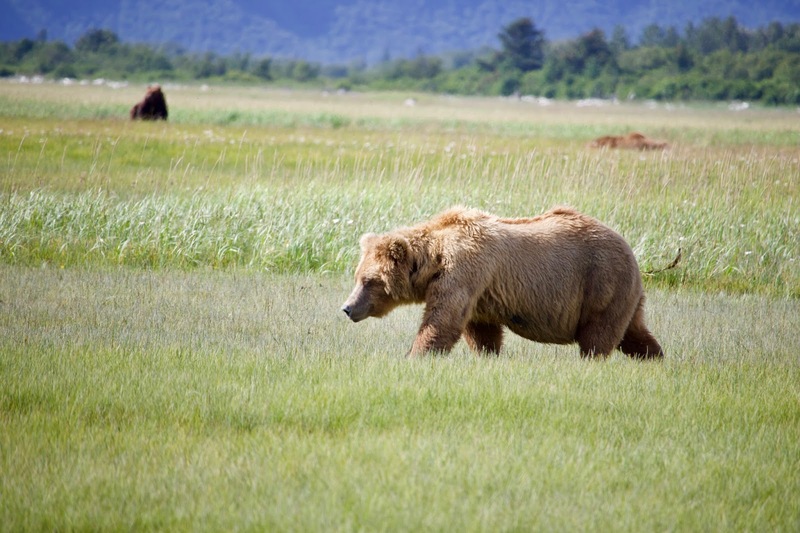 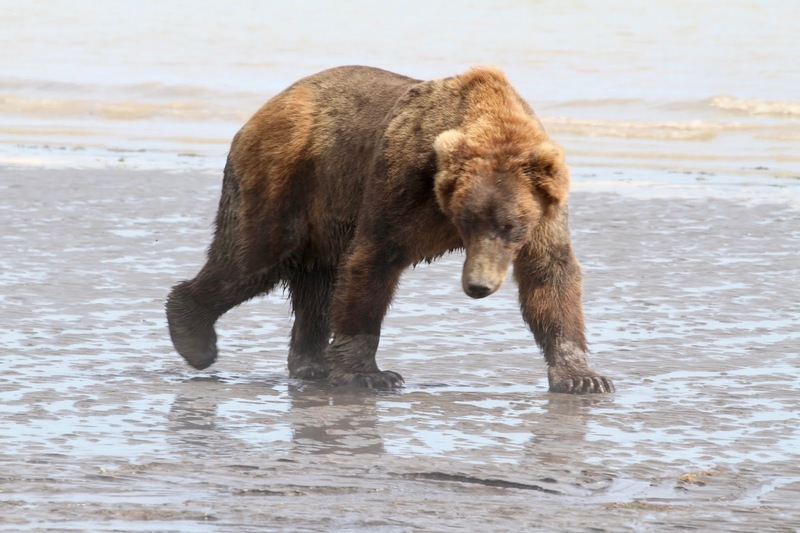 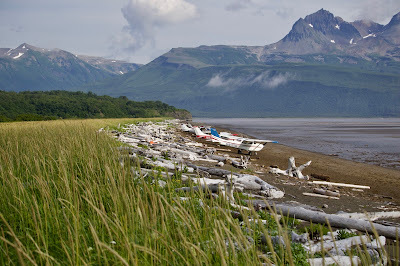 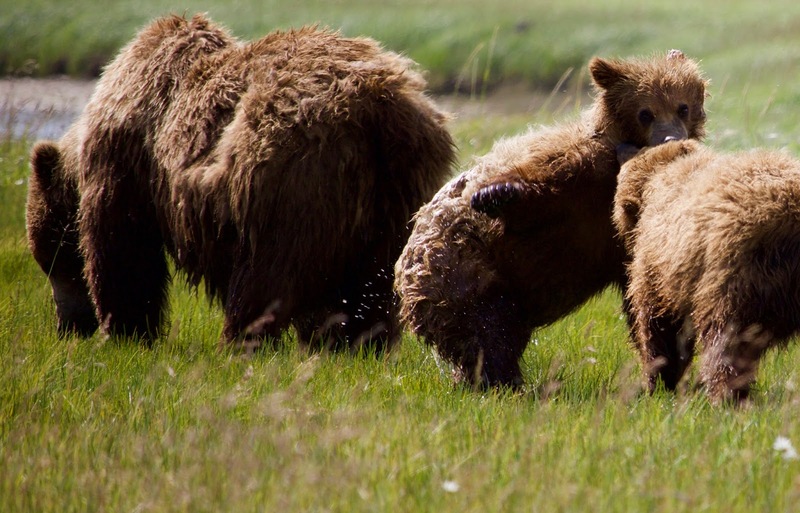 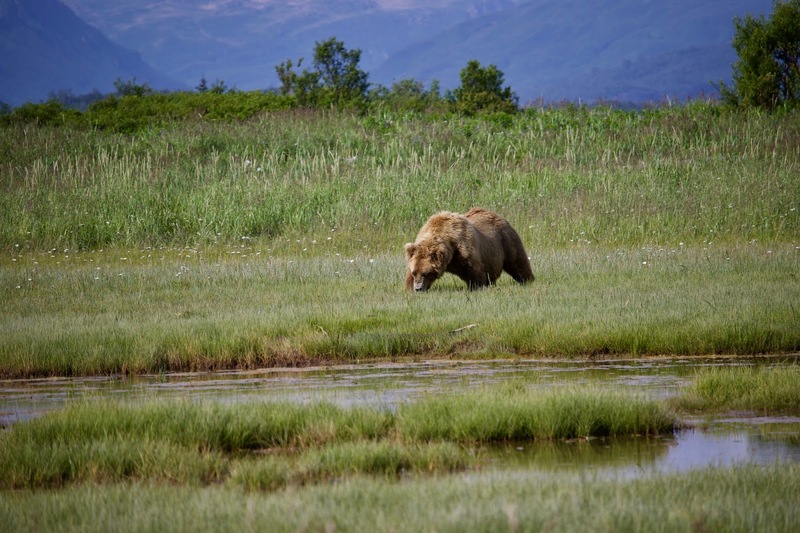 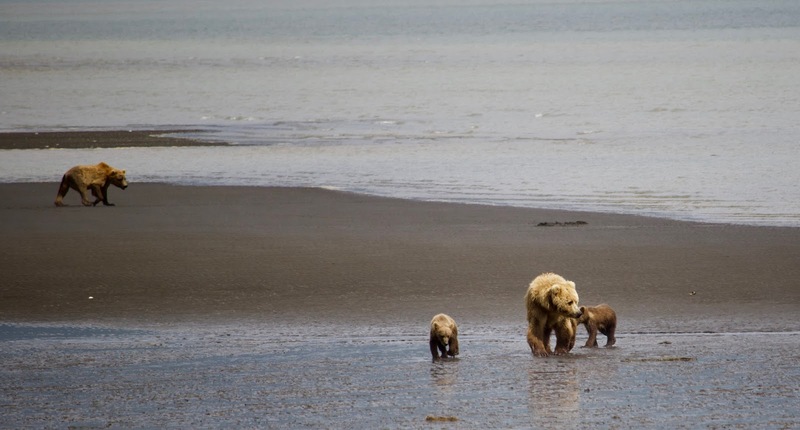 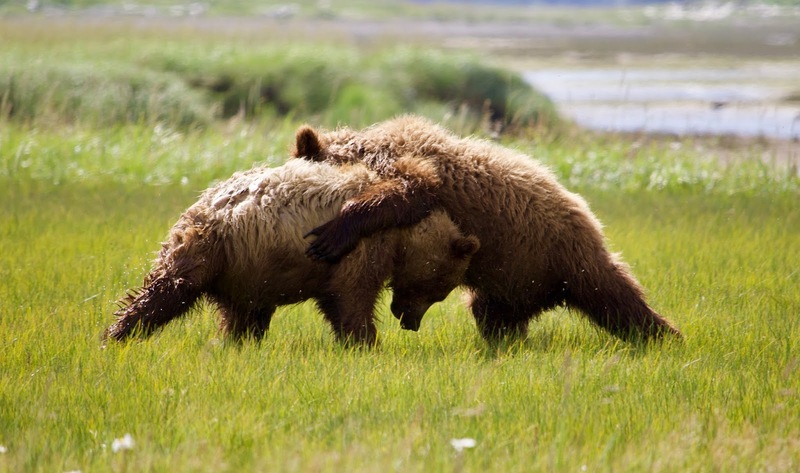 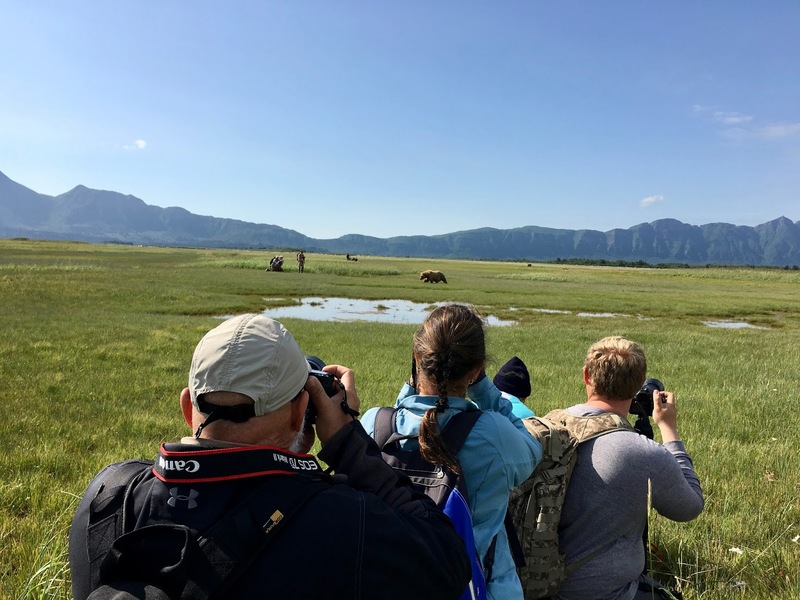 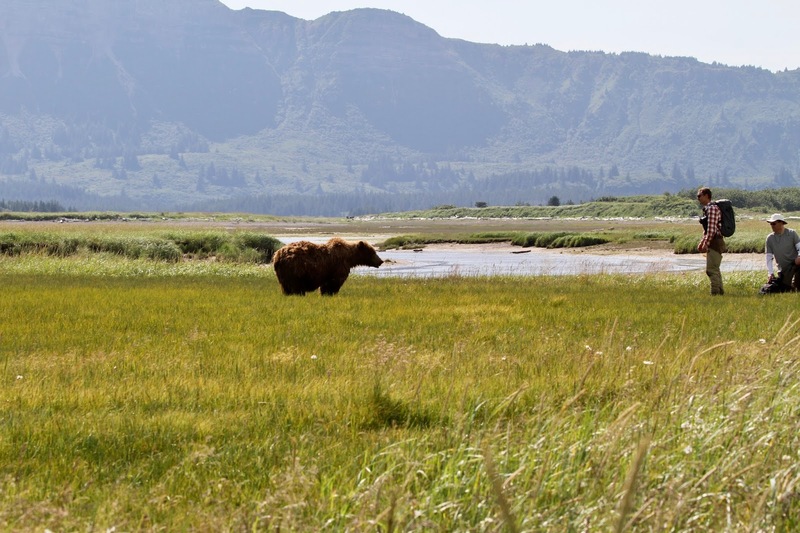 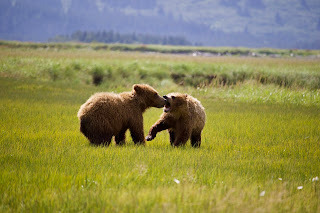 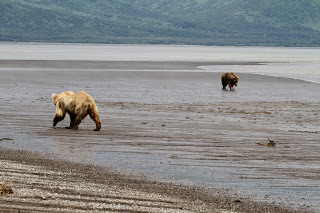 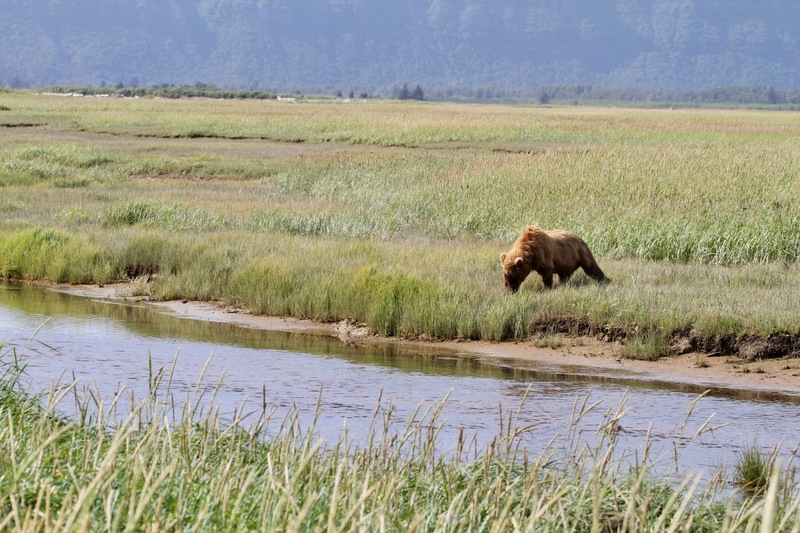 The rules for visiting Katmai National Park are very strict and only certain businesses are allowed to visit. 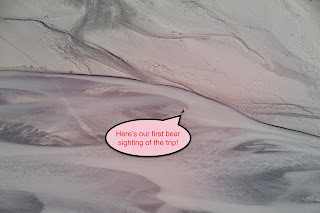 We landed safely, on a beach! 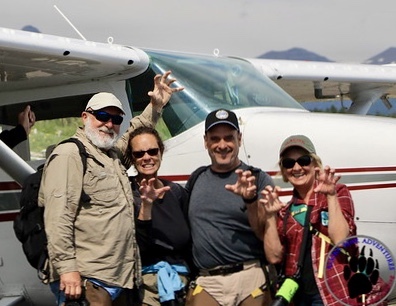 Yes, that is Steve...George was in a separate plane. ...she got very close...so close that our guide had to stand up to startle her away. If you listen close to end of the video (at the beginning of this post), you will hear the guide ask us "okay, who packed the salmon"?!? 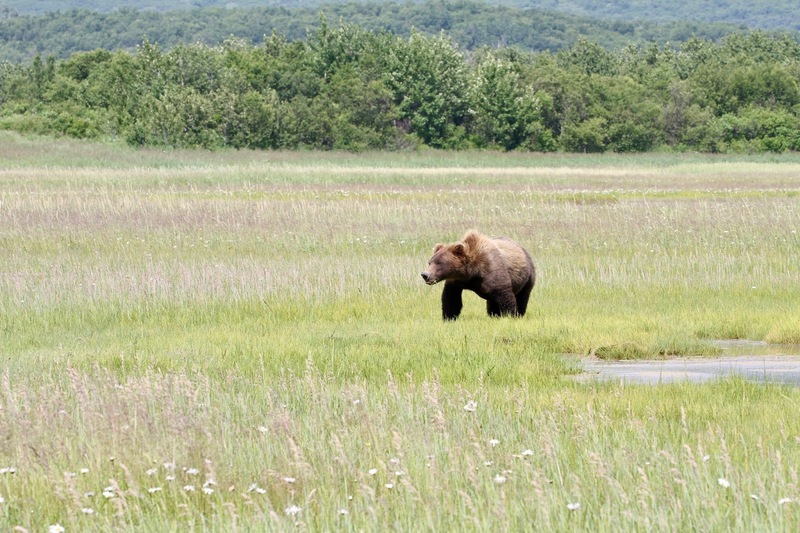 ...she took a quick sniff of us and went on her way. 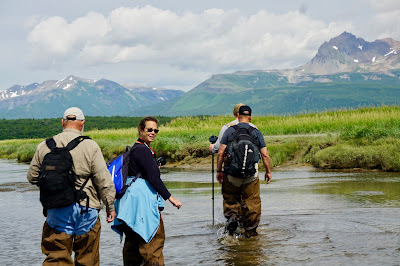 Here's a good shot of our "Alaskan sneakers"...they are wading boot pants. 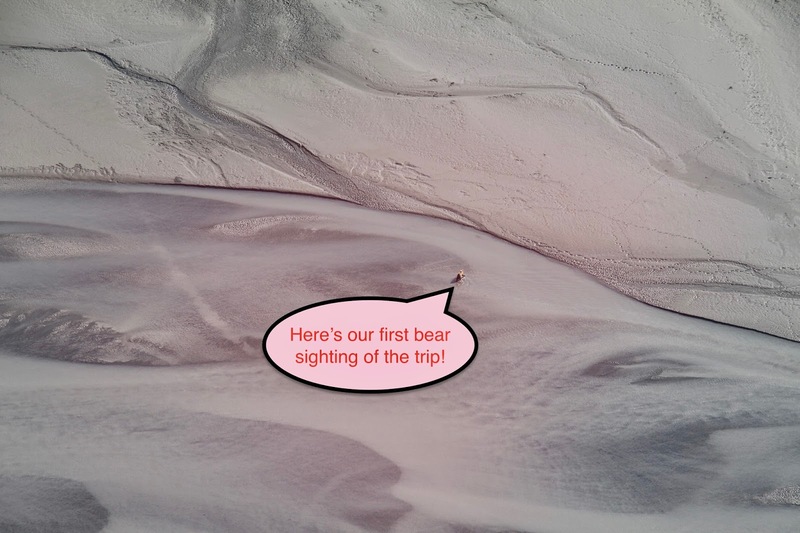 We were so excited to have seen that first bear...we never imagined how fantastic the rest of the day would be! 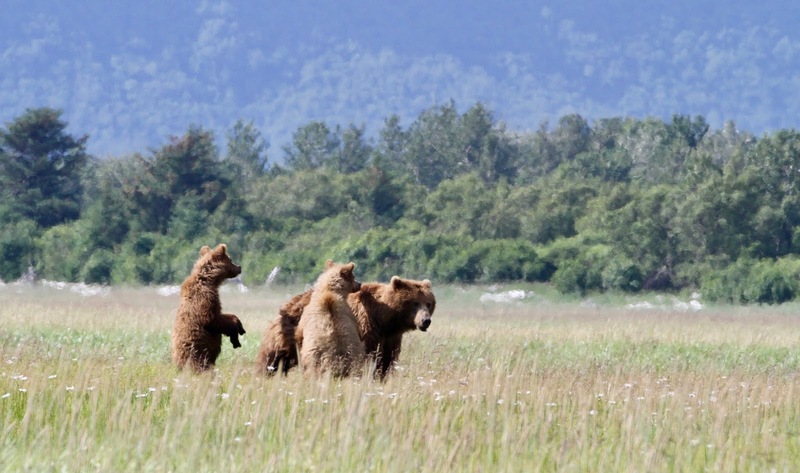 In our groups of six people; everyone must crouch down together so as if to seem bigger to the bears...no one is allowed to wander off on their own. 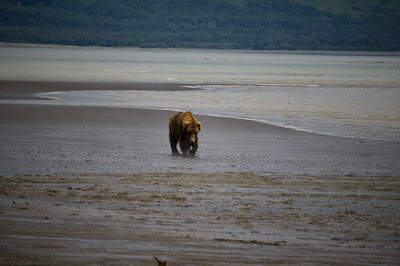 ...and then moving toward the beach. ...he didn't get too close and seemed to be in a hurry to get somewhere. Bear #4...she was also in the background of that earlier shot...she and her cubs are alert because of the male bear we just saw. ...we sat down as a group and had lunch! 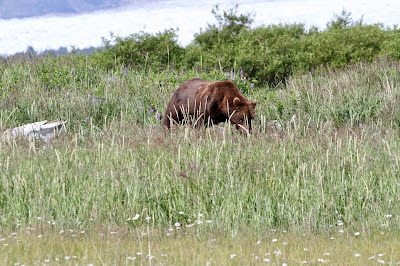 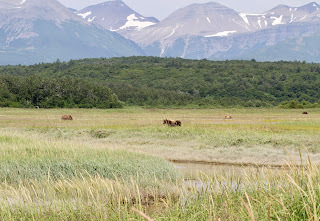 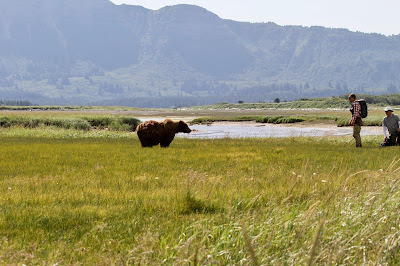 I just couldn't believe what was happening...having lunch in a meadow in Alaska with Grizzly (brown bears)...UNBELIEVEABLE!!! 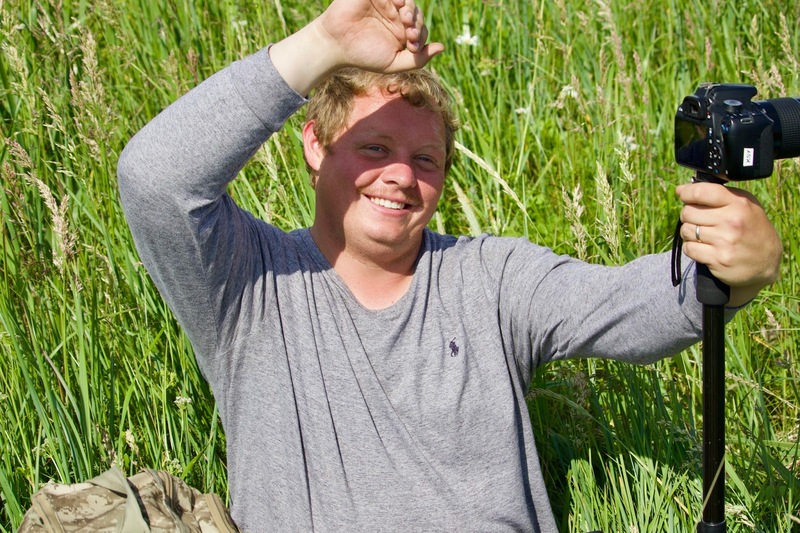 "Fluffy" - our pilot and guide...such a neat young man...he has a real passion for nature! 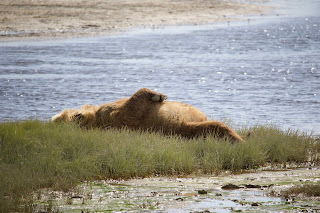 ...and she rolled over to nap some more. Bears #5, 6, 7, and 8...we continued walking and found four bears in the same field - Fluffy said that was unusual because bears are very territorial. ...then they went back to eating. 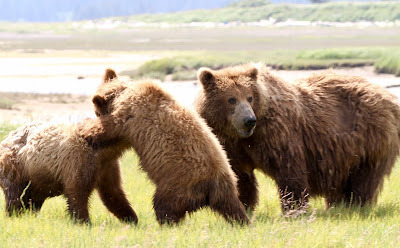 We were always in single file, so as not to appear aggressive to the bears. At this point, we're headed back to the beach; the tide is coming in and we need to make sure there is enough runway to take take off and head back! 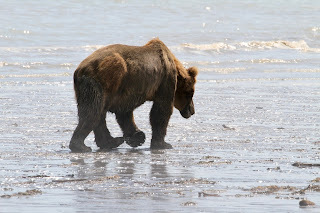 We crested the dune and saw more bears on the beach...Bear #9, he's clamming! 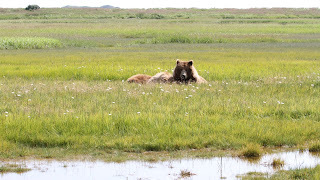 Then we see the King of the Island, Bear #10 - he is huge - Fluffy recognizes him and says he's only seen him a couple of times. 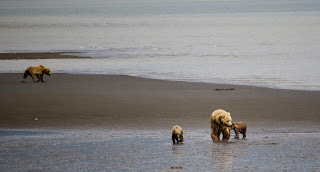 ...moving her cubs to safety. 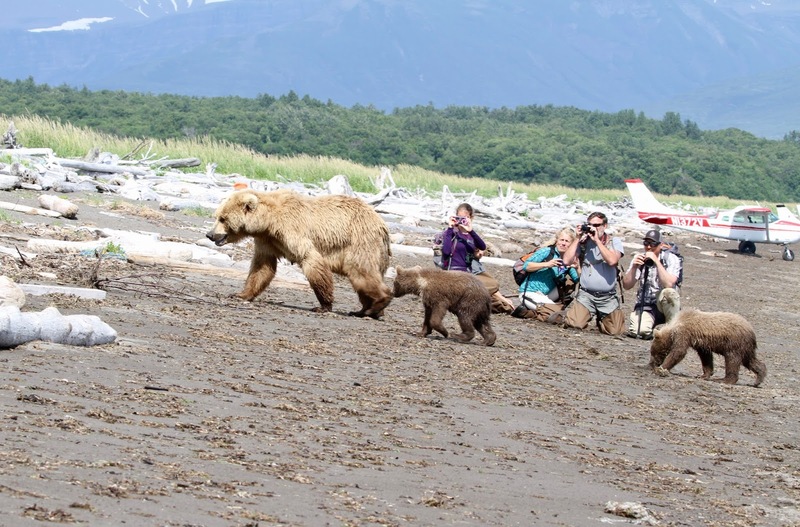 All five groups of people were instructed to stay still and crouch down on the beach. 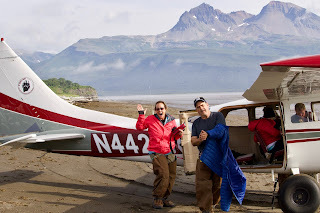 We were only feet away from the planes and the tide was rising! 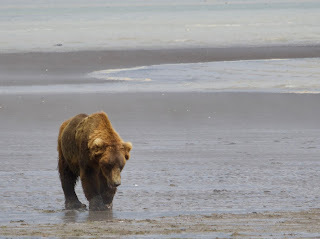 ...and just like that, the King moved on down the beach.